In terms of linguistics, Salomaa's songs are interesting in two ways: he sings in a broad east Finnish accent (Savonian dialect) and his lyrics often - not in this case, though - contain words that are called Finglish, a term originated by Martti Nisonen, professor at the Suomi College in Hancock, Michigan, in the 1920's and referring to a mixture of English and Finnish common among Finnish immigrants to North America. According to Finnish music archives there are some 15 recorded versions plus a number of re-releases of the song. 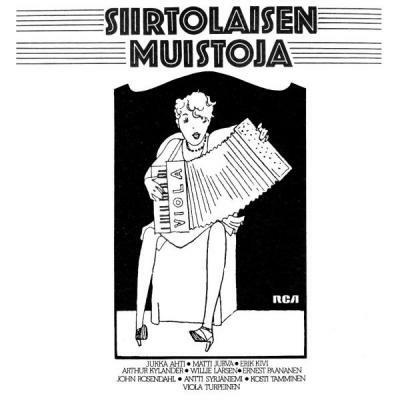 The samples include the original version from 1929 by Columbia Records, a political song movement version by Kom-teatteri from 1979, a marching band version by Tuomari Nurmio & Hugry Tribal Marching Band from 1992, a reggae version by Soul Captain Band from 2001, and a jazz(ish) version by Yötyöväen Orkesteri from 2010.